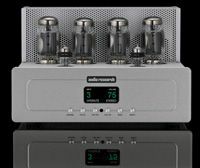 Audio Research boosts the power to create VSi75 integrated valve amp | What Hi-Fi? The latest arrival from US high end company Audio Research is the VSi75, a £7498 integrated valve amplifier unsurprisingly offering an output of 75W per channel. Based on the company's VSi60, which continues in the range, and handbuilt in Plymouth, Minnesota, the new amplifier features technology trickled down from the Reference 75 power amplifier. While it uses the same quartet of KT120 output valves and two 6H30 driver valves as the VSi60, it also has a range of enhancements to increase the power – to 75W per channel against the VSi60's 50Wpc – while improving the sound. A new power transformer, designed around the KT120, is used, along with wide-bandwidth output transformers and proprietary coupling capacitors, as used in the Reference 75. It also has doubled up on the bulk power supply capacitors compared to the VSi60. The company says that the changes give the new amplifier 'tremendous resolution of detail, silky and extended highs, surprising weight and authority, and the ability to develop an immense soundstage'. It's an open-chassis design with new-look casework featuring a natural anodised top-plate, and has a silver perforated cover over the transformer and filter caps, with an optional cover available for the valves. The display uses a clear LCD readout, with numerals in green and lettering in white, and shows input selection, volume and valve bias. Five line inputs are provided, and there are 4ohm and 8ohm speaker taps. The soft-touch buttons on the front are for power, volume up/down, bias and input, and these controls are duplicated on the remote control, along with display brightness and a valve hours readout option. The Audio Research VSi75 will be available next month, via UK distributor Absolute Sounds.